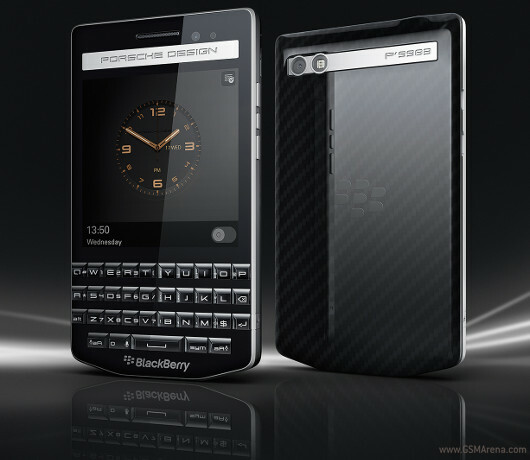 After leaking back in August, the new BlackBerry Porsche Design P'9983 has been officially announced today. It's the successor to the P'9982 from last year, which itself succeeded the original P'9981 from 2011. The new smartphone comes with a 3.1-inch 720x720 touchscreen, an 8 MP rear camera, and a 2 MP front-facing camera. It's got 2GB of RAM and 64GB of storage that can be expanded via a microSD card slot. 4G LTE support is in, as are dual-band Wi-Fi (802.11n), an FM radio, Bluetooth 4.0, GPS, and NFC. The P'9983 is powered by a pretty old Qualcomm Snapdragon S4 Plus chipset, which comes with a 1.5 GHz dual-core CPU and an Adreno 225 GPU. Keeping things juiced up is a 2,100 mAh battery. The phone runs BlackBerry OS 10.3. Its dimensions are 119 x 67.1 x 10.6 mm, and it weighs 140g. The main talking point about this device will undoubtedly be its design and premium finish. It comes with sapphire glass for the camera lens, forged stainless steel for the Porsche Design logo and chassis, and "a special glass-weave technology for the back door". In the box you'll find a premium stereo headset, an international charging kit, a polishing cloth, and a USB cable. Exclusive aftermarket accessories will also be offered, including back covers made from fine Italian leather. These will be available in a myriad of different colors. The BlackBerry P'9983 will become available by early October at Porsche Design stores, as well as select carriers and retailers across the world. Pricing hasn't been announced, but don't expect this handset to be cheap. At all. Loving my Z30 everyday, can't wait for the Passport to be released, especially here in the Philippines. What would be the price range ??? ?